First impressions matter. Your storefront is the first glimpse your customers have of your business, and your storefront should attract customers instantly. Colline Integrated Security Services offers a variety of customized options in storefront entrances to better fit your specific requirements. Our wide selection of custom paint options guarantees a perfect match to your existing storefront. Glass can also be customized to better improve the thermal properties of the building and can result in lower annual energy costs. Whether you’re looking to improve an existing portion of your entrance or to replace the entire storefront, Colline Integrated Security Services can help you design a customized solution. The primary motivation of any business is to attract customers and provide a positive workplace environment. Storefront windows will do just that. Not only are they the face of your business, they greatly increase your curbside appeal. All our windows come in a variation of customized options and features to not only meet, but surpass your needs. We guarantee fast and efficient response times to accommodate all of your glass needs. Our full-sized glass shop is stocked with laminated and tempered safety glass to ensure efficient and quick repairs. Updating and replacing glass can not only increase energy efficiency, but can also improve the security of your building. Colline Integrated Security Services offers a wide range of bulletproof glass, impact-rated and hurricane-rated glass. We can also provide decorative paneling to fill glass pockets where glass is not an option. 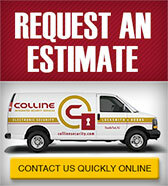 We offer free on-site estimates for your convenience. Shop Drawings and Spec Sheets are available upon request.